Yesterday a misty morning hinted at the forthcoming arrival of autumn as surely as the berries in the hedgerows. Yet again I was undecided what to do with what was forecast to be the last fine afternoon for the week. Not being able to face the hassle of purchasing maggots and sorting out my trotting gear I shoved some other tackle in the car and went fishing for carp. I make a distinction between carping, carp fishing, and fishing for carp. Carping is carried out by clones who can't think for themselves or fish without all the latest paraphernalia. Carp fishing is done by dedicated carp specialists who use whatever tactics are required. Fishing for carp is just that - carp just happen to be the quarry of the day, the fishing is the important bit. I am really rubbish at catching carp, but I had found a spot where some basked on warm afternoons, and thought they might be easy enough to tempt. Sure enough, they were where I expected them to be. Being a clumsy stalker, and having left my polaroids in the car so failing to spot fish, a couple moved off as I spooked them. They weren't unduly concerned. The one I saw waddle away from the margin was a common that looked as if one of it's parents had been a puffer fish. Out in the weedy corner a couple of backs were breaking the surface like those of tiny whales. There were a few carp around alright. I'd found this area when out looking for dragonflies, and it wasn't long before a brown hawker was inspecting me. Deciding I wasn't a threat or a meal it set about hawking, and hovering, swooping up and catching insects to be devoured on the wing. This gave me something to watch while I waited for carp to find the floaters I'd scattered in two likely looking places. Carp materialised, cruising slowly, but failed to home in on my offerings. The rudd were better at that. The Oily Floaters were soon being nibbed at and pushed around, with an occasional swirl being made by a bigger fish that thought it could swallow one of them. Then I noticed one of the more distant baskers was sticking its lips out and sucking on something in the weed. Pellets were thrown at it and it liked them. Reasoning that there is no point casting in where fish aren't feeding I walked round to get closer and throw the fish some more food. I went back to my original position and watched from afar. 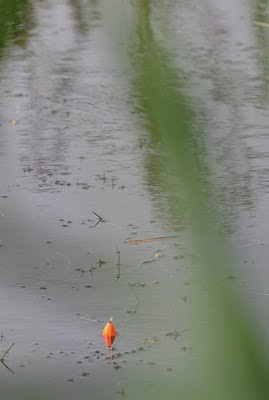 There seemed to be at least two carp taking the floaters, possibly three. I dismantled my landing net so it wouldn't catch in the undergrowth and made my way to the spot I'd baited up from. How I was going to land a fish there was anyone's guess. It wasn't a proper swim, just a slight thinning of the reeds and reedmace with a mat of Canadian pondweed in front of it. If the fish was big enough I'd be willing to get wet, otherwise my plan was to heave and haul to get the fish through the weed. I wasn't confident of a take though, carp seem to know I don't like them much! This is my excuse for not catching them by design. In the past they have picked up my baits intended for tench, barbel and perch, even deadbaits being fished for catfish and pike, yet when I set out to catch carp by design I fail. This is not a pike float! I waited until the fish were actively feeding, not exactly avidly, but they were moving about and taking the occasional floater, before casting in. Then the waiting began. Nothing much happened. My usually silent mobile rang, and after I'd finished the call a carp approached my hook bait. All a tremble I stood in the reeds poised for action. At least five times the stupid fish sucked at the bait without taking it. Then it siddled away. Par for my carp fishing course. On recasting the controller must have landed on a carp's back as there was a huge swirl as a fish bolted out of the swim. With it being quite a confined spot I thought all the carp would have vacated the area, but in just a couple of minutes there were a couple feeding again. Watching on of them I saw it fail to ingest a floater that wasn't attached to a hook. This gave me some consolation that it wasn't my duff presentation that the fish had been wary of, and it probably was just dumb. The day started to 'go off', as did the carp. So I went off too.